The eastern cottontail is the most familiar rabbit in Virginia and easily recognized by most Virginians. The upper body parts are typically reddish-brown, lower parts are white, and it often has a white spot on the forehead. Its short, fluffy tail is also white, hence the name cottontail. They are typically about 16.5 inches long and weigh approximately 3 lbs. Rabbits resemble rodents, but are actually lagomorphs. Unlike rodents, rabbits have a short tail, large hind legs, and two sets of upper incisors. 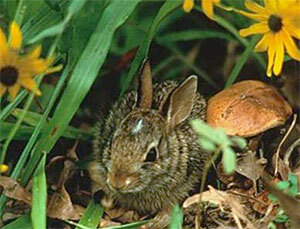 The eastern cottontail has a wide distribution and is found throughout most of the eastern United States. It is the most common rabbit species in Virginia, and is found in every county of the Commonwealth. If you see a rabbit in Virginia, chances are that it is an eastern cottontail. Cottontails have been referred to as the “protein pill” of the animal kingdom. 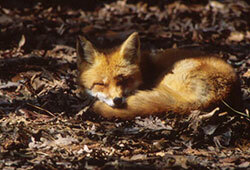 They are perhaps the most heavily preyed upon game species in Virginia. In most years, 80% or more of adult cottontails are killed. Foxes (both gray and red) are among the cottontail’s most significant predators. Cottontails may comprise nearly 50 percent of the fox diet. Another important predator is the bobcat. Bobcats show a distinct preference for cottontails and other rabbits. 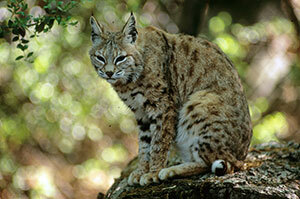 As much as 75 percent of the bobcat diet may consist of cottontails. Other mammalian predators include coyotes, dogs, house cats, minks, raccoons, skunks, and weasels. Many avian predators also prey upon cottontails. Typically, these are the larger avian predators, such as the barred owl, broad-winged hawk, great-horned owl, red-shouldered hawk, and red-tailed hawk. Interestingly, crows may be an important predator as well. A study conducted in the 1950’s that analyzed the food habits of crows found that the most frequent food item was young cottontail. Snakes also prey on cottontails, but typically only on young animals. Even red squirrels reportedly take young cottontails. Hunting can be a significant mortality factor, depending upon the intensity and timing of the harvest. Highway mortality can be severe in some places. Of the parasites that afflict the cottontail, “wolves” are probably the most well-known. These worm-like parasites are actually the larval stage of the bot fly. The fly lays eggs on the fur of rabbits. When these eggs hatch, the immature larvae bore into the skin of the rabbit. They develop there just under the rabbit’s skin until they are approximately 1.5 inches long. They then burrow out of the skin and fall to the ground, where they burrow into the soil, pupate, and later emerge as adult flies. Infestations are greatest in warmer weather and usually disappear by late fall or early winter. The parasite is not harmful to the rabbit, in most cases, and is not dangerous to humans. Hunters will often discard rabbits that are infested. However, there really is no reason to do so. The larvae are restricted to the skin and do not damage the muscle tissue or otherwise affect the edibility of the meat. Do not harvest rabbits that appear sluggish or do not run. Wear rubber gloves when dressing rabbits. After removing the gloves, wash your hands with antibacterial soap. Cook rabbit meat thoroughly. Do not eat rare or undercooked rabbit meat. The cottontail breeding season typically begins in late February and lasts through September. However, some breeding activity occurs in January. Gestation lasts 27-32 days and most young are born March-July. The eastern cottontail is a very prolific species. High reproductive effort is needed to offset its low survival rate and low reproductive success. Females will usually mate and become pregnant immediately after giving birth. Does may have 3-7 litters in a year. A buck (male cottontail) and doe could multiply into 25 rabbits in less than a year. Cottontails consume a wide variety of plant material. During spring and summer, they feed mainly on herbaceous plants such as clovers, grasses, and low broad-leafed weeds. They can be a nuisance in the garden during this time of year, consuming cabbage and other summer crops. During winter, their diet shifts to buds, twigs, and bark. They are particularly fond of sumac bark. They also consume waste grain left in the field. The eastern cottontail is an early successional species. They may be encountered in a variety of habitats, but are most abundant in areas that contain a mixture of weeds, grasses, and short brush. Since rabbits are the favorite prey of so many predators, patches of escape cover in the form of dense shrub thickets, brushy fencerows, hedgerows blackberry thickets, and brush piles are crucial. Areas where these patches are in close proximity to feeding areas provide ideal habitat. Well-drained fields of dense grass, such as switchgrass, provide prime nesting cover. Cottontail populations have declined over the past fifty years or so. The cause of the decline has been the loss of early successional habitat (particularly woody escape cover) due to conversion of farmland to other uses, changes in farming practices, and urbanization. These habitat changes have likely been exacerbated by increases in the cottontail’s important predators. However, areas with good habitat can still support abundant populations. The single most effective way to increase cottontails on an area is to increase both the quantity and quality of cottontail habitat. The main goal is to provide plenty of escape cover in close proximity to feeding areas. 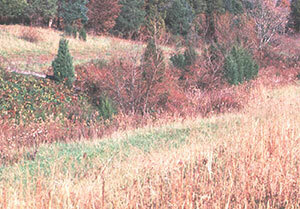 For example, a strip of VA-70 lespedeza can be planted adjacent to a food plot. This allows cottontails to feed safely. They can escape into the dense cover when attacked by a predator. Clover, winter wheat, and rye are good choices for food plots. Switchgrass plantings are also a great addition to any property being managed for rabbits. Of course, plantings are not always required. You should survey your property and identify patches of good escape cover (e.g. blackberry and plum thickets, overgrown fencerows, etc). Natural patches of escape cover should be maintained. Natural vegetation can be maintained for feeding areas as well. Periodic disking will set back succession and allow native grasses, forbs, and legumes to flourish. Areas should be disked about every 3-5 years. Fall and winter disking is best as disking during this time of year tends to result in more favorable plants. This can also be accomplished through burning. Burning is perhaps the most effective tool for creating and maintaining early successional habitat. You should consult with a professional before beginning a burning regime. 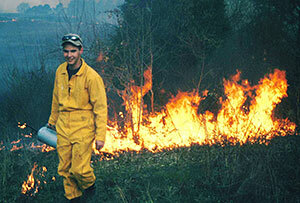 The Department of Forestry offers classes on prescribed burning. For most landowners, cottontail management will not be a primary objective. However, habitat provided on marginal areas of your property can benefit cottontails as well. For example, on the edges of crop fields and pastures, you can “cut back” the woods and allow shrubs and young trees to naturally regenerate. This practice is further enhanced by allowing a strip of herbaceous vegetation to regenerate on the edges of fields. Field edges are generally much less productive anyhow; so, no real cost is incurred and the field borders will provide safe feeding areas for cottontails. You should also leave waste grain in crop fields until it is time to plant again.